Imagine a day at the office that doesn’t leave your back and neck aching. With its impressive cushion, the Dream Office (M) chair provides optimal support for your back and neck so you can focus on the task at hand. Endorsed by the American Chiropractic Association, this chair has the same technology as the Stressless recliners, but is suited to fit an office setting. You can rely on the Plus™ and Glide systems to be working beneath the surface providing a level of comfort you never expected in the office. The 360 swivel and wheels make this polished chair crucial for any office. 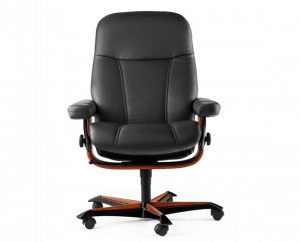 The Dream Office (M) chair offers correct support for your back and neck to help boost your productivity in the office. The Plus™ system responds to shifting weight and makes adjustments ensuring your neck and back are always supported. The Glide system balances your weight as you lean back or move forward. The chair conforms to your body with its Comfort Zone technology allowing you to sink into the chair and experience a perfect balance of cushion and support. The 360 swivel and wheels mean you can navigate the room with ease. Your neck and back work for you all day long. It’s time to give your neck and back the support they need. Boost your productivity and protect your health when you buy the Stressless Dream Office (M) chair. We ship to any address in all 50 United States. Ask for details regarding shipments to Canada. For quality assurance, all Vegas (L) shipments must be insured for accident, loss, or damage. Once your shipment leaves our facility, a tracking number is provided via email. Unless otherwise stated, delivery means “to your door”. Shipments must be signed for by someone over 18 years of age.